BULLETIN: Linda Baie tried to leave a comment on the IRA site and said it’s not working. Each time you type in the code, it’s rejected. I just tried twice and had the same results. I sent a note to the editor and hopefully the problem will be cleared up soon. I’ll let you know when it is. Thanks for your patience. Remember when I got shut out of the Google Hangout with Ruth Culham, Kate Messner, Lisa Yee, and Varian Johnson? The link I was provided would not work that evening even though it had worked the night before when we rehearsed. I gave up trying when there were only 15 minutes left in the program. Next day I was invited to post my own list of suggested mentor texts on the IRA blog, so I did. And now it’s posted. If you’re interested, here’s the link. 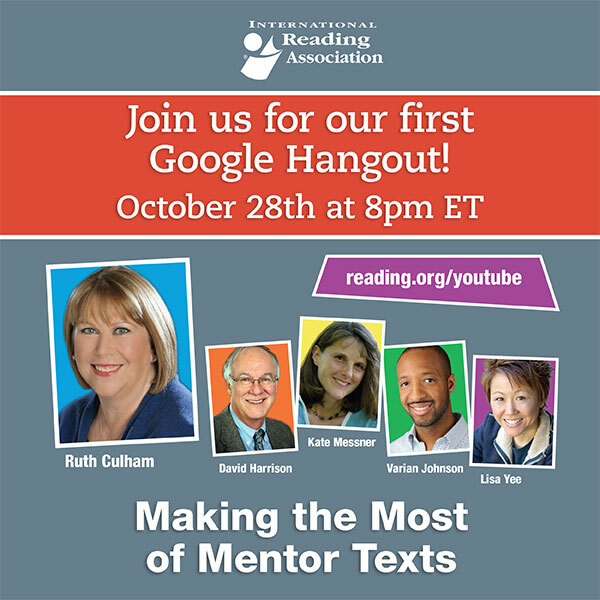 Some of you know that when the night came for Ruth Culham’s Google Hangout hosted by International Reading Association, my link failed me and I was never able to join the rest of the group to participate in the show. Talk about bummed out! 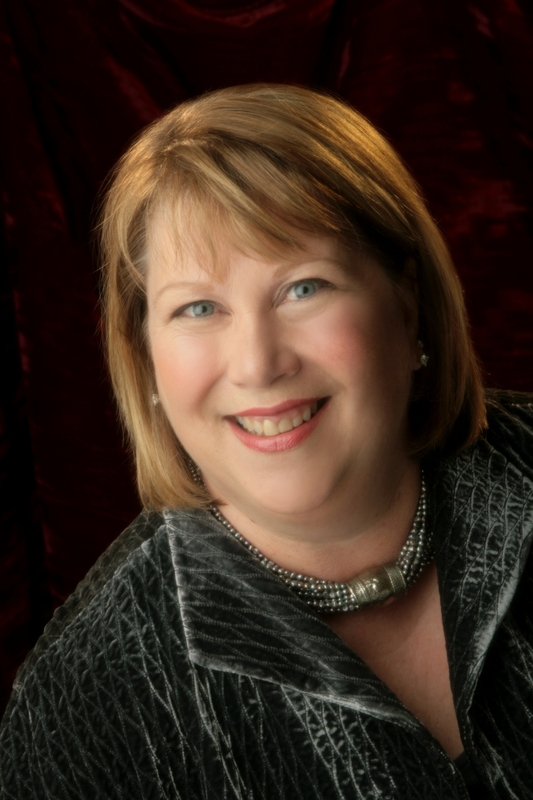 As a follow-up though, the moderator for IRA, Jayme Gravell, talked with IRA editor April Hall, and they invited me to send along my suggestions for mentor texts to add to their blog post. I thought it was quite gracious of them and I accepted. Here’s the link so you can see what has already been posted. Mine should come along before long. My question to you is, do you use mentor texts yourself and, if so, what sources would you recommend? The floor is open. The other day I told you about the upcoming Google Hangout with Ruth Culham and four panelist authors. This is a reminder that the event is coming up next week on Tuesday night. We’ll have a rehearsal Monday night and then stand by for fun the following evening. I hope you’ll hang out with us and tell anyone you know who might be interested to come too. It’s free and I like the topic of using mentor texts. It’ll stream live on the IRA YouTube channel. The link is: http://www.reading.org/YouTube. When we’re finished it will be saved on the IRA YouTube page so people who couldn’t join us live will be able to watch it at their convenience. REMINDER: Be sure to vote for the word of your choice for October’s Word of the Month Poetry Challenge. Voting ends tonight. To vote, scroll down to the poll shown on September 22, click in the circle beside the word of your choice, go to the bottom of the box, and click on vote. SPECIAL PLEA TO TEACHERS: Many teachers have worked with their students in the past to write poems for Word of the Month and post them in the Young Poets’ special box. I hope that as many of you as possible will encourage your students to vote for the October word and then write poems for you to post. This is a celebration! It’s our 5th anniversary! The other day I told you about the upcoming Google Hangout with Ruth Culham and four panelist authors. Here’s a fancier version of the announcement, far better than my poor means to create. 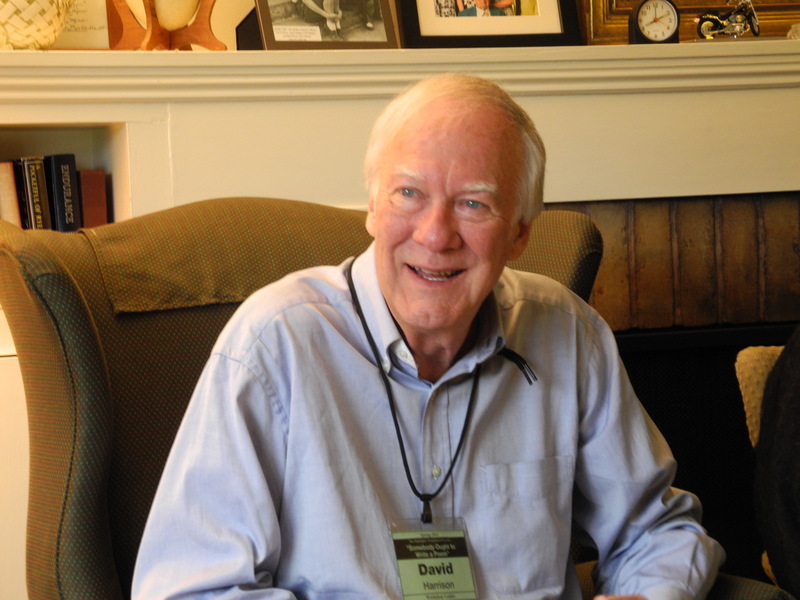 I’d like to tell you about plans in the works at International Reading Association to try something new. They’re calling it a Google Hangout with Ruth Culham. The event is scheduled to take place at 8:00 p.m. ET on October 28. Ruth will be joined by four panelists: Varian Johnson, Kate Messner, Lisa Yee, and David Harrison. The target audience will be reading and writing teachers, and we’ll discuss using mentor texts to teach the craft of writing. Although plans are not yet finalized, current thinking is to offer an audience member a 30 minute virtual visit with one of the authors. The idea would be to issue a phrase to either tweet or email to IRA within an hour after the Hangout ends and they would randomly select a name. The winner would get to choose the author they’d like to have the visit with depending on their grade level, the unit they’re working on in class, etc. Finalized plans should be announced soon but if you’re interested or know someone who might be, mark your calendars now for October 28 and look for more information as it becomes available. For more information about Ruth and the other participants, check these links.